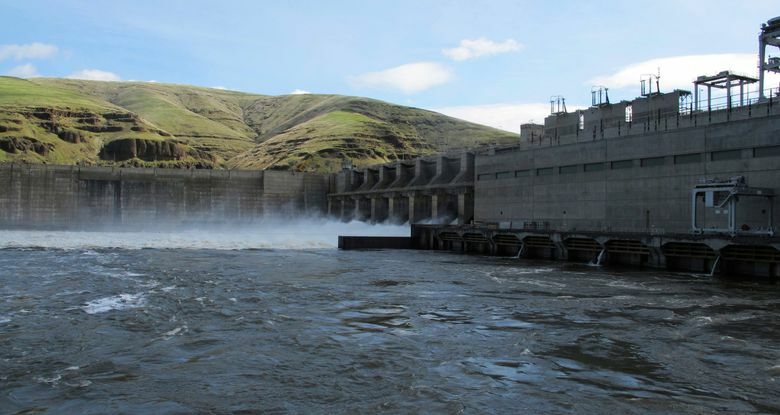 The agreement among BPA, the U.S. Army Corps of Engineers, Bureau of Reclamation, the states of Oregon and Washington, and the Nez Perce Tribe, is intended to benefit both fish and hydropower. An agreement filed in U.S. District Court in Portland on Tuesday establishes a new regime for spring spill of water over Columbia and Snake River dams to benefit young salmon in their migration to the sea, while enabling the Bonneville Power Administration (BPA) to take better advantage of power markets. The three-year agreement, reached after months of negotiations, enables increased spill for fish to swoosh over dams (instead of going through powerhouses) during hours when power prices are low. Then, the spill can be reduced, and more water run through generators, when prices are higher in daily markets. The intent is to increase the survival rates of salmon and limit the cost for the program to no more than was spent in 2018 — and possibly less. The pact, signed by BPA, the U.S. Army Corps of Engineers, Bureau of Reclamation, the states of Oregon and Washington, and the Nez Perce Tribe, is intended to last through 2021, when a court-mandated environmental review of river operations is expected to be completed. Monitoring will be ongoing to determine how it affects fish. Spill in comparative survival analysis has shown to help boost survival of salmon in their travel through the hydropower system. But the new regime is unproven. The agreement calls for a pause in new litigation while it remains in effect. The agreement will help BPA take advantage of power markets that may fluctuate greatly through the course of the day. They may dip as renewable energy, such as California solar-energy farms, pour power into the grid, and rise when those sources fade during dark early-morning and evening hours. The agreements follow years of court battles over the benefit of spill to salmon, with different models projecting different impacts on fish of water sent over the dams rather than through the powerhouses. The signing of the agreement does not end controversy over spilling water to help salmon. The states of Oregon and Washington must change water-quality standards to implement the agreement — a step Northwest RiverPartners (NWRP), a consortium of ports, utilities and businesses, urged for the good of salmon should not be rushed. “Spill can be a useful tool to aid salmon in migrating downstream; however, too much spill can cause gas bubble trauma in fish, which can harm or even kill them,” Jim Litchfield, of NWRP, said in a statement. The agreement has been attacked in a statement released by two Washington members of the delegation, Rep. Dan Newhouse, R-Sunnyside, and Rep. Cathy McMorris Rodgers, R-Spokane. They called the plan “worse than useless,” and said it would cost ratepayers an extra $38 million in 2019. Citing information relayed to their offices by the BPA, their joint statement said scientists from the National Oceanic Atmospheric Administration had not identified any benefit of the increased spill to salmon. The BPA official who briefed the congressional office on Dec. 13 could not be reached Tuesday for comment. “We have acknowledged that there is competing science about the benefits of spill and as the agreement stipulates, there will be careful monitoring and evaluation as we move forward,” said Mainzer, the BPA administrator. Michael Milstein, a spokesman for NOAA Fisheries West Coast Region, said his agency needed more time to respond to a Seattle Times information request about agency research examining the agreement’s increased spill. Guy Norman, a member of the Northwest Power and Planning Conservation Council representing Washington state, said that NOAA Fisheries has yet to conduct its analysis of the impacts of the new spill agreement on salmon.